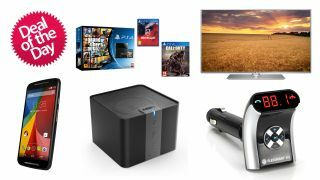 TechRadar Deals: PS4, Xbox One, phones, speakers and more! TechRadar has a team of tech-savvy super-elves putting together our daily deals, and today we've got some great ideas for discounted Christmas presents. We've got PS4 deals, Xbox One deals, phones, speakers and more! Let's start with this deal on teh Now TV box at Argos! Great present for the whole family, it'll allow you to stream TV shows and movies direct to your TV. The box is currently discounted to £13 and comes with 2 months of free Sky Movies! If you're looking to pick up a Bluetooth speaker, this deal is definitely worth a look. The Anger A7908 portable speaker has a 20-hour battery and it's currently discounted to £29.99 on Amazon. However, if you use the secret code 22YXFEGY you can get an extra £10 off making the price just £19.99. Got a car that doesn't have Bluetooth or line-in functionality? That doesn't mean you can't still listen to music from your phone while driving! Using an FM transmitter you can tune your radio into your phone and listen that way. This FM transmitter is currently available at Amazon for £46.99 but with our exclusive secret code TRXMAS25 you can get £12 off to make it £34.99! How about this for a good deal on a 50-inch LG TV? The LG 50B650V is currently just £499 at Currys offering lots of bang for your buck! Or if someone in your life wants a smartphone for Christmas, you could do a lot worse than going for this great deal on the excellent Moto G. It's a fully fledged Android smartphone and it's on Amazon for just £119.95. Lots of good deals on the PS4 at the moment, and this is one of them at Game. Get the PS4 bundled with GTA V, DriveClub and Call of Duty: Advanced Warfare all for £349.99. Or if an Xbox One is more your huckleberry, you can currently grab one at Argos bundled together with Minecraft, Destiny and two controllers for just £349.99.